I, Dipl.-Biol. (MSc.) 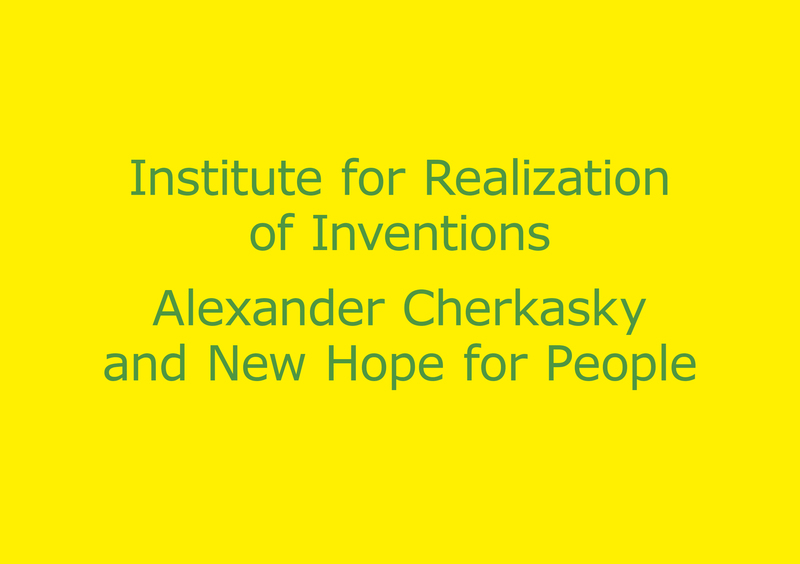 Alexander Cherkasky, ask your help for the realization of my following project: I wish to create the Institute for Realization of Inventions for efficient, dynamic, multiparallel and transparent realization/implementation of inventions as solutions of especially biomedical problems independently from status of inventors and patents! With this Institute Ebola, AIDS/HIV and cancer can be combated. Viruses can be combated both in cells and outside of cells! In addition, it will be easy to check whether viruses are available at any place or object of choice. I have all the according inventions, which are published! The proposed Institute will have internet platform for open evaluation and discussion of inventions as solutions of (preferably biomedical) problems and then realize inventions as problem solutions, but the priority is, that my anti-cancer and anti-viral inventions will be realized/implemented. The realization will be carried out by contract research partners and later own laboratories can be established. Thus this first in the world and unique Institute will create a real new hope for people. The Institute will work to combat also rare diseases and to make causal therapies available to so many people as possible. I, Dipl.-Biol. (MSc.) 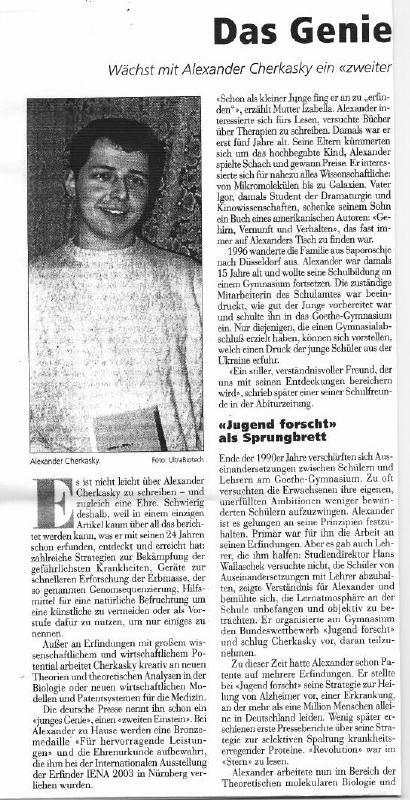 Alexander Cherkasky, was born in 1981 in Zaporoshje, Ukraine, since 1996 living in Dusseldorf, Germany, am award-winning and media-highlighted biologist and inventor of new anti-cancer, anti-bacterial, anti-viral (to combat viruses both inside and outside of cells) and anti-autoimmune cures, life-extending fusion proteins, efficient IVF (in vitro fertilization) (in presence of mitochondria), cell therapies for regenerations, especially for neural regeneration, high-quality synthetic diamonds and diamond-like materials, high-quality lubricants, innovative metallurgy products, light and solid composite materials, especially new construction materials, efficient batteries as well as I have inventions of new multiparallel diagnostic and fast genome sequencing systems. My anti-viral inventions allow to combat different viruses both in the cells (by using my cell-specific, cell-penetrating and blocking nucleic acid (anti-viral ribozyme or antisense RNA)- transportating fusion proteins disclosed in my German patent DE19925052) and outside of cells by using my invention of cell-traps for viruses (my invention DE19951694 from the year 1999). DE19951694 is a multipurpose invention comprising genetically modified cells, especially immune cells, which express, for example neural or neurogenesis proteins (like NGF, BDNF and/or other neural proteins) for (in vivo) immune cell-induced neurogenesis and neural regeneration (claims 5 and 16 and description, column 5, lines 30-36) and these genetically modified cells, preferably immune cells, express also, or alternatively, myelinogenesis proteins for immune cell-induced myelination as well as myogenesis proteins for immune cell-induced regeneration of muscles (claim 14) and/or angiogenesis proteins for immune cell-induced angiogenesis (claim 3). Cell-traps for viruses express anti-viral antisense RNA and/or anti-viral ribozymes (for neutralizing or cleavage/destruction of viral RNA or DNA) and receptors for viral recognition, (like CD4 for HIV, see claim 11 of my DE19951694). Fusion proteins and fusion protein complexes according to DE19925052 can recognize targeted cells, (already infected cells or cells, that can be infected), through the recognition region, penetrate them and internalize into them through the membrane penetration domains (MPD) or cell penetration peptides (CPP) and bring into cells molecules, especially anti-viral RNA (such as specifically cleaving ribozyme(s) or specifically neutralizing antisense RNA). But, the recognition of my inventive work comprises, in addition to citations by Laboratorios del Dr. Esteve and Fundacio Privada Institut de Reserca de la SIDA-Caixa, also citation of my German patent DE19937512 for fast genome sequencing in the US patent US7163658 of the American inventor Rouvain Bension, citation of my German patent publication DE19953696 for cures for Alzheimer’s disease in two American patents US7557182 and US7902156 of Angiochem, citation of my German patent publication DE19822406 for anti-prion molecules in the US patent US8034766 of E I du Pont de Nemours and Company and of University College London, citation of my German patent DE19925052 (for gene therapy, to combat viruses and for extension of cell lifes) in two US patents US7999073 of Lonza and US7320859 of Amaxa (a small German firm sold to Lonza), citation of my US patent application US20080242565 for new lubricants based on chemically modified biomasses in the US patent US8273694 of Californians Jeffrey A. Brown, Joseph A. Duimstra and Jason P. Wells, citation of my DE10162870 (for anti-cancer fusion proteins) in the US patent US8679500 of Institute National de La Sante et de la Recherche Medicale (INSERM) (Paris, FR), Universite de Bretagne Occidentale (Brest, FR) and Centre National de la Recherche Scientifique (CNRS) (Paris, FR), citation of my DE102007027596 (for novel material mixtures and chemically modified, e.g. selenylated biomolecules) in the Chinese patent CN102718882 of the Agricultural Nanjing University as well as citation of my US20090070900 (for new light and solid materials containing modified biomolecules and biomasses) in the Chinese patent CN101871047 of Yunnan Lincang Xingyuan Germanium Ind Co Ltd. These citations confirm the use of my inventions as basis. For my novel anti-cancer fusion proteins, I was awarded the Bronze Medal „For Outstanding Achievements“ and the Honorary Certificate of the international inventors competition IENA (Ideen-Erfindungen-Neuheiten, Ideas- Inventions-New Products) 2003 in Nuremberg. IENA is the largest international inventors competition in Germany already over 60 years. About me and inventions of mine reported media including Stern (The Star), bild der wissenschaft (Picture of Science), Juedische Zeitung (Jewish Newspaper), Juedische Allgemeine Zeitung (Jewish General Newspaper), Westgerman Newspaper, New Rhein Newspaper and Rhein Post. I have 9 German patents (including my patents DE19925052, DE10161899 and DE10161738 for anti-cancer fusion proteins and my patents DE19929530, DE19937512 and DE102008037890 for methods and devices for fast genome sequencing), over 30 German patent applications and 5 US patent applications as well as 5 international patent applications. The paradox is, that people need my inventions, but people do not get my inventions. Moreover people do not know broadly about my inventions. With 10 million USD funding, I wish to raise, the situation can be changed. It will be possible at least to make the Institute for Realization of Inventions (with head-office in San Francisco) with according internet platform for open evaluation and discussion of inventions and with at least two departments, Biomedical and Chemical, to highlight and to spread the information about my inventions, (especially about my anti-cancer and anti-viral inventions and about my invention of new personalized medicine, (that people have and can use the genetic information in their cells for making personalized individualistic patient-specific fusion proteins for combating cancer!)) and about the Institute and to make the first according projects with contract research partners. On the Institute's platform for open discussion and evaluation of inventions also potential research partners (invention realization partners) can present their opinions and services! This platform shall be continuously highlighted in known media. The invention realization processes must be also transparent and broadly highlighted. The Institute for Realization of Inventions can organize open and transparent internet competitions (based on quality of inventions and argumentations of inventors) in order to find best solutions for scientific and technical problems of people and this Institute can participate from success, but will do both non-profit work, (especially to maximize biomedical innovation, to promote personalized medicine, to combat rare diseases (with open joint efforts) and to make therapies, especially against Ebola (to combat viruses in and outside of cells) available to so many people as possible) and merit-based work and can participate on commercializations. The Institute for Realization of Inventions will be the optimal organizational solution, that people will broadly benefit especially from biomedical inventions, will get more causal therapies, will know about existing solutions of biomedical problems and about the quality of these inventions and about arguments of inventors, that risks will be reduced for patients, sponsors and investors, that society will consolidate for efficient, dynamic and transparent realizations of inventions as solutions of problems, especially for combating diseases and especially infectious diseases such as Ebola and HIV, and that invention realization process will be easy, qualitative, open, transparent, dynamic, efficient and independent from status of inventors and patents worldwide as well as that people can realize personalized anti-cancer fusion protein cures based on their genetic information!